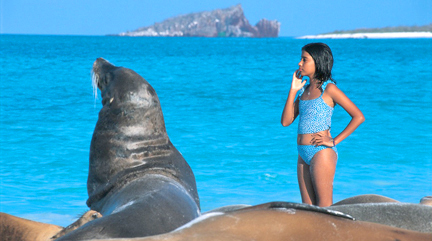 Ecuador offers travel adventure to the Amazon and the pristine Galápagos Islands. These remote islands have been their own ecosystem for millennia and many of the Galápagos species are not found anywhere else in the world. 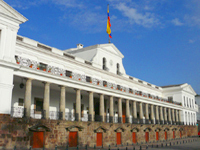 Straddle two hemispheres and explore Old Town Quito, a UNESCO World Heritage Site. Visit sights in and around Cotopaxi National Park. Its centerpiece, Mount Cotopaxi, is Ecuador’s second highest peak and one of the world’s highest active volcanoes. Search for the local flora and fauna, as well as the highland hummingbird. About 600 miles off the coast of Ecuador, is a haven for some of the world’s most unique and varied wildlife. It was this diversity that first led naturalist Charles Darwin to propose that species evolved in response to their environment. 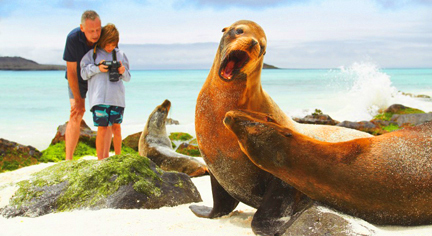 Observe Galápagos penguins, marine iguanas, fur seal, bright orange Sally Lightfoot crabs and the blue-footed booby constantly. This Galapagos cruise offers access to five onboard Naturalists with interests in ornithology, geology and marine biology. Join them on hikes, Zodiac rides, or the ship’s deck during one of the spontaneous, thrilling wildlife encounters when the Captain spots a pod of orcas or a blue whale and changes course to pull alongside them. To make the most of your 10-day Galapagos cruise, we offer plenty of choices, including shore landings before breakfast hikes or coastal explorations from Zodiacs and kayaks. Go deep water snorkeling. And if you don’t want to get in the water, simply climb aboard the glass-bottom boat for an undersea experience while staying dry. Arrive Guayaquil by late evening; it’s a short drive to Hotel Hilton Colón, where we spend the night. After the 1 1⁄2-hour flight to the Galápagos, board the ship. 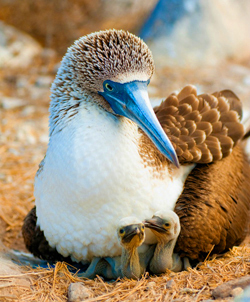 Have up-close encounters with colonies of nesting blue-footed boobies (seasonal) and magnificent frigate birds, plus sea lion harems. 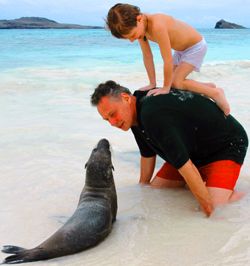 Spot swallow-tailed gulls, marine iguanas, land iguanas and fur seals along the cliffs. Walks and Zodiac rides to choose from. Enjoy walks, Zodiac forays, or deep- water snorkeling with hundreds of fish, white-tipped reef sharks, rays, eels and more. Visit rabida’s bright red beach to see wildlife, including a nesting colony of pelicans, and Galápagos hawks, doves, Darwin’s finches, mocking birds, and more, plus gorgeous scenery. Various walks, kayaking, and snorkeling are on offer. 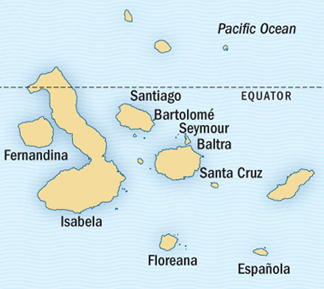 Fernandina Island is the youngest island and one of the most pristine tropical islands left on Earth. Look forward to hikes over relatively recent lava flows, and to Cormorant point for marine iguanas, flightless cormorants, Sally Lightfoot crabs, and intriguing tide pools. 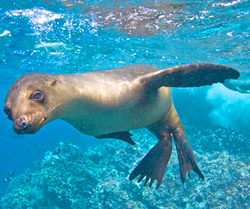 activities also include Zodiac forays and snorkeling, perhaps with sea turtles, penguins, or cormorants. A small black sand beach, a sea turtle nesting site, offers wonderful morning swimming. a more challenging hike over a rugged area of shoreline, then inland through a land iguana nesting colony; and a shorter walk within the iguana colony. Walking, birding, kayaking and deep water snorkeling, with Zodiac rides are on offer. A landing on one of the most important sea turtle nesting sites in Galápagos. Walks take us past a salt water lagoon to see shore birds; up a small hill to land bird and endemic vegetation terrain. 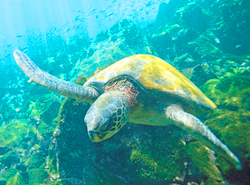 Snorkeling, plus Zodiac rides and kayaking to Buccaneer Cove. Visit puerto Egas for a coastal trek to fur seal grottoes, masses of marine iguanas, sea birds, and more against vivid green sea mosses. Swimming and snorkeling from the beach. Look for fur seals, blue-footed boobies, pelicans, sea lions and more. 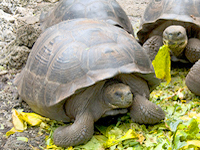 Walks in the El Chato tortoise preserve for encounters with giant tortoises in the wild. Return to sea level and explore bustling Puerto Ayora before embarking the ship. Wet landing on a green, olivine beach for a hike and spectacular scenery — tuff stone cliffs “worked” by sea and wind. Zodiac rides along the coastline reveal blue-footed and red-footed boobies. Kayaking, swimming from the beach and snorkeling from Zodiacs off an islet in the bay are all options. In the afternoon, more opportunities for snorkeling and Zodiac adventures and in between the sights & activities, life aboard our expedition ships is rich and varied — marvelous meals to enjoy in an always-casual ambience. Engaging talks by our Naturalists are part of the Daily recap ritual that binds our expedition community and increases the fun. Socializing with staff and fellow guests, or retreating to one of the ship’s nooks & crannies with a good book is always an option as is reserving a relaxing massage or revitalizing Wellness treatment.